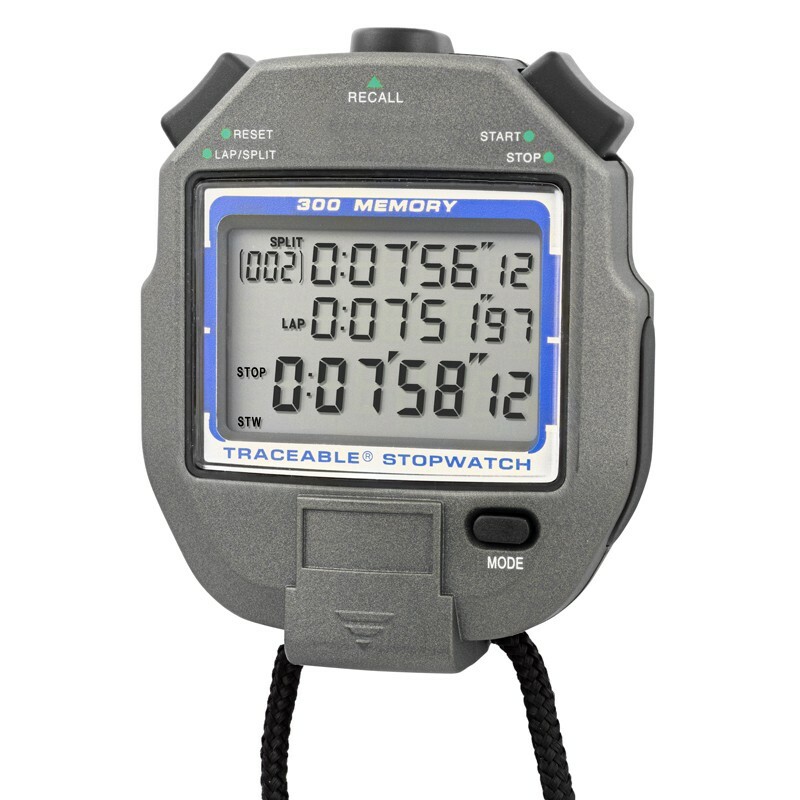 Stopwatch times to 9 hours, 59 minutes, 59 seconds, 99 hundredths. Resolution is 1/100 of a second and accuracy is 0.001%. Three-line display simultaneously shows running time, cumulative-split, and interval-split. Can recall up to 300 memories both during and after event timing. Provides repeat functions of countdown alarm timing. Set it to count down at any time from 10 hours to 1 second. When zero is reached, the timer alarms and begins to count down again from the programmed time. This repeat cycle continues automatically until stopped. Display always shows running time remaining to zero and cycles counted from 1 to 300. Features also include functions of pacer, stroke, and speed calculations. As a chronograph, the unit displays time of day in hours, minutes, and seconds, AM/PM, date, and day of the week. It also has a time-of-day alarm. Water-resistant, O-ring-sealed, and shock-resistant ABS plastic case has non-skid rubber sides—ideal for lab and plant use.